As I'm understanding things, it will be best to relocate north and east of Columbus, OH. Could the Zetas speak to the more recent statements regarding portions of that will Ohio that will break apart, either during the New Madrid adjustment and/or subsequent Shift. My first assumption was that this may refer to northwest Ohio; due to the tearing of the Seaway. Or are they referring to the landmass that will gradually disappear due to the adustment and rising waters, both from the west and primarily from the Ohio River, prior to and after the PS? My question relates more to understanding the statements - by the Zetas - regarding portions of Ohio breaking up. And because I haven't seen them relate that to a specified area, I wondered if they might be referring to northwest Ohio - which may be seriously affected by the tearing of the Seaway. Implied in our previous ZetaTalk but not explicitly stated, is that southwestern Ohio will lose elevation during the New Madrid adjustment. We implied that Columbus, Cincinnati, and Toledo will find their toes in the muck in the Aftertimes. Certainly an elevation map of a 675 foot flood shows Toledo under water, but Columbus appears high and dry. We also stated that Ohio will find themselves looking into an expanse of water as the Ohio river floods in the Aftertime, yet a map of a 675 foot flood shows the Ohio River and tributaries broadened a bit, but certainly not an inland bay as we described. We also stated that where the New Madrid fault line runs up through Ohio and under the Great Lakes can be seen in rock strata maps. The New Madrid adjustment will shatter rock there, ungluing the rock strata just to the south so that older rock in central Ohio will separate from the rock east of Cleveland and Columbus. The line of separation can be seen on rock strata maps as a thin triangle, pointing sharply to the south. Eastern Indiana and most of western Ohio has a different rock strata, so will not participate in this drop. This loss of elevation will not be apparent until the rising flood waters in the Aftertime push up the Mississippi. What was the motives behind the terror bombing of the Oslo's Government House, followed by a horrendous massacre of nearly 100 Norwegian youths on a political summer camp. http://edition.cnn.com/2011/WORLD/europe/07/23/norway.explosion/index.html?hpt=hp_t1 [and from another] http://english.aljazeera.net/news/europe/2011/07/201172475828109599.html Breivik is reported to have belonged to right-wing political groups and to have had a negative view of multiculturalism and the flow of immigrants into Europe, particularly those coming from Muslim countries. Officials have declined to discuss Breivik's motive other than describing him as "right wing" and a "Christian fundamentalist". Reports suggest he belonged to an anti-immigration party, wrote blogs attacking multi-culturalism and was a member of a neo-Nazi online forum. Just as with the suicide bombers he declares despicable, Breivik used the vicious murder of innocents to make a political point. Organizations driven by fear and hatred find their membership limited and inclusive, and frustrated by the inability to gain members, they seek to advertise in the hopes of breaking a cap on their membership. Muslim groups do this by a jihad, whereby suicide bombers get press coverage, and the jihad purpose at least a mention in the press. In like manner, this anti-immigrant hate group felt they were losing the battle, with the Arab Spring driving many from northern Africa into Europe to escape the violence. Breivik anticipated giving endless interviews from his prison cell, becoming a celebrity, and gaining many converts for his cause. What will happen in Estonia, Latvia and Lithuania during the European tsunami? Do I understand right - these Baltic countries can expect disastrous impact of a 100 foot tall wall of water? And after Pole Shift these countries will come to an end their existence, will they? By the time the European tsunami has washed over Denmark, full force at 100 foot high, it will have lost some of its force but the volume of water to be dissipated will not have lessened. The tsunami will arrive at the coastlines of Estonia, Latvia, and Lithuania at neatly the same height but with a rapidly diminishing force. Where the force of the wave was sufficient to carry it across Denmark, Denmark is low land, and provides little resistance. The coastline of Estonia, Latvia, and Lithuania rises above the 100 foot level rapidly, thus breaking the wave. Nevertheless, residents there should prepare for the worst, returning to their homes only when the tsunami has passed. The Zetas began giving the U.S. government reliable information on the PS decades ago. They backed up their reliable predictions with lots of information on what to expect prior to the PS. The people in power (hardly worthy to be called leaders in the true sense) acted selfishly and ruthlessly to insure their comfort and survival during the difficult times to come. How have Service-to-Other leaders on other planets responded to similar situations? Pole shifts are not part of every awakening. Given your knowledge of us humans, what steps would you have expected STO leaders to take here on Earth? I sometimes think about the time and opportunities lost over sixty years. If the time and resources could have been focused on solving problems related to the upcoming PS, instead of building well-stocked bunkers for the elite, what could we have accomplished? It comes down to individual decisions, in every case. Where there have been examples of heroism - Harrington declaring that he was going to give the public regular reports, for instance - the cover-up over the pending pole shift is the sum of the parts! The success of the cover-up over the pending pole shift and the nearby presence of Planet X are due to several factors. First, a limited number of people are aware of the facts. Going back to the days of Roswell, these were a few members of MJ12, who numbered only 2,000 people in total with only a few of them aware of the inbound Planet X and the approximate date of arrival. The CIA, led by highly Service-to-Self individuals in those days, controlled the outcome by holding brain-storming sessions which concluded that the public could not handle the truth, and would panic, killing millions. This was of course a self-serving conclusion. Harrington was an example of an individual who decided otherwise, and took steps to inform the public. He was MJ12, in the small group of individuals who were aware of our warnings and in possession of whatever scientific data had been gathered by the Naval Observatory. He was promptly killed in a manner that sent a strong message to others - in a painful and lingering death - while his attempt to inform the public was blocked on every front. Not only were a limited number of people in the know, the results of this and other assassinations were thoroughly spread, by word of mouth, though this group. Those who intended to tell the truth either died or decided to wait for their opportunities, which have yet to arrive. The cover-up has now spread to a larger number of people, but threats, assassinations, disinformation, and ridicule are effectively used to keep the truth from the public. First, heads of state are told that panic is the larger worry, and that the passage will cause no more than a few earthquakes and high tides. Then they are bribed and threatened with death or injury to their loved ones if they talk. Since the public is convinced that NASA sees the Universe with eyes the common man does not possess, their curiosity is deflected by the fact that NASA is not talking about a pending passage, but in fact ridicules the concept. Well known figures like Hoagland are employed to spread disinformation, also, giving the public alternative explanations. Here again individual decisions are involved. Individuals who break through with the truth find their message quickly blocked and countered, and they have no more than a single chance to try this before they are killed in apparent suicides or accidents. This is the single most compelling reason that Obama has not informed the public. By the use of skilled assassins and espionage, which the CIA has at their disposal, a small group of people thus controls the perception of the public. Even in instances where the public is in possession of the facts, such as the murder of JFK and 911 being an inside job, most of the public believes the lie. Seeing this, individuals must make a decision - to waste their life in what would likely be a failed attempt or to wait for their opportunities in the future. In time, cover-ups fail, due to the strength of those enforcing them waning or the emergence of facts that cannot be denied. They wait for this. Then there are those involved in the cover-up who benefit. Their individual decisions are for themselves, to ensure a place in well-stocked bunkers for the elite, and to deflect the messy panic and demands an informed public might present. And in between these two groups - the would-be heroes and the selfish - is the bulk of mankind who hear confusing messages and are not in possession of decisive proof as yet. They wait because they want to avoid the ridicule they see others, such as our emissary Nancy, suffering. Is all this human behavior what we expected? Absolutely, and completely in accord with 3rd density worlds elsewhere. It does not take a passing planet, a pole shift, to create this scenario. Human history is filled with examples, as is the history on worlds elsewhere. I understand that eastern Montana will be one of the most desirable areas after the PS, but I see that this region, western North Dakota and parts of south central Canada houses the Bakken oil field. http://bakkenoilfield.net/2011/03/22/bakken-oil-field-map/ I would assume that oil fields will be desirable targets of control for the elites, so how can this region be one of the better places to live if such a field exists? In all our discussions on the elite bunkers, there is little mention of their plans for the Aftertime. Their choices are clearly driven by the relative safety of the bunker location, the ease by which the elite can travel to and from the bunker location, and how well guarded from the starving hoards both before and after the pole shift the location might be. They also want the bunker location to have a pleasant climate both before and after the pole shift, with the potential of beach access in the Aftertime so they can return to living a lifestyle that is, in essence, a perpetual vacation. The elite are, in the main, a spoiled lot who have never been bothered with such mundane problems as growing food or maintaining an infrastructure. In short, they anticipate their pole shift survival plans to be having enough supplies to get them through until they can return to shopping and leisure living. We have described the pole shift as being so devastating that oil fields will be consumed in fire, refineries will explode and burn, and pipelines rupture and burn. Mankind's infrastructure will be ruined, and except for some regions such as S Africa where the limited technology is self sufficient, will not approach its prior status. Certainly, the oil fields of the Middle East will not produce more than oil collected from pools on the surface, not refined. Use of oil worldwide will return to what it was centuries ago. The elite do not contemplate such a world, nor do their hired technocrats in the main, as denial is much more comfortable. They envision a world where repair will be needed. Thus establishing bunkers in the Bakken oil field would be the last thing they would consider, as extracting oil from shale rock is difficult. I appreciate and understand the reluctance to comment on President Obamas thoughts, motives, etc., but if the Zetas are able to comment, I was wondering if Obamas willingness to continue to put the US in increasing debt (at the end of Bush's historic run the US was 10 trillion in debt. It is now over 14 trillion in debt and Obama is trying to get the debt limit raised to over 19 trillion) has anything to do with the fact that he knows that in a few years at most, it won't matter. Also, assuming the Chinese also know this, why do they continue to invest their surplus instead of spending the money, however covertly, on things to help them in the Aftertime? We have mentioned that the status quo is likely to be continued up to and even into the Last Weeks, as those who benefit from the status quo see no alternative for themselves. Bankrupt countries will continue to print money, devaluing their dollars, as the alternative is to declare bankruptcy, making their money virtually worthless. This attitude extends to corporations and the banking industry, where their failure is a specter too gruesome to contemplate, envisioned as making matters worse, so they are pumped up with loans or legislation to avoid failures and layoffs. In truth, and in history, such essential bankruptcies can be avoided when better times return, and this is the rationale for continuing down the path of greater and greater debt. But it is the lack of alternatives that drives the process. This is a global issue. Were the US to falter, China would be hurt immensely, not only because the notes it holds would become worthless but because one of its major customers, the US consumer, would be broke. All are likely to stumble forward thus, maintaining the status quo, until the public has switched entirely to the barter system as the only medium of exchange that has any meaning. Where a country has the funds to help their citizens through the pole shift and into the Aftertime, they may do so if their actions do not have to be explained during legislative debate. China is an example, with their ghost cities. Obama's actions on Executive Order 13575 is another such example, where he has laid the groundwork for extensive infrastructure support for homeless citizens after the New Madrid or other such anticipated geological disasters within the US. But where the citizenry is starving and desperate today, many governments cannot plan for the future without revealing the truth about the pending passage, which puts them headlong conflict with the cover-up. The fear of assassination, as we have explained, prevents this. .
Where have the days when the alien presence could be denied in the media, with government officials claiming UFOs are weather balloons or swamp gas or it is all mass hysteria? Here we have an example of where disclosure has arrived. The Sao Paulo case appeared on the news in Brazil, on TV, and was certainly not debunked by the fascinated observers. A rotating wheel, pulsing in the center, seen from all angles. What does this mean? As always with these major displays, those entranced below are getting a telepathic message. Sao Paulo is on the coastline of Brazil, at a stress point where the bowing of S America during the current 7 of 10 roll is pulling the top of S America westward, and tending to stretch and pull apart Sao Paulo. The message is explaining this to those below. The OSCE is an example of the many organizations around the world that will play a part during the coming times. Most have heard the rumors about the pending passage and have done some independent research to ascertain the validity of the rumors, measuring the Earth wobble, for instance. During private meetings there is intense discussion on how to help, as it is clear that existing government bodies intend to do little, being in a state of a type of paralysis. Why did the OSCE, which had been entirely Eurocentric, decide to branch out in the direction of central Asia, along the highlands that will afford an escape for many drowning Europeans? Entire countries in Europe - Finland, Estonia, Lithuania, Belgium, and the Netherlands, for example - will be swallowed up by the waves if not during the pole shift, then within the two years following. Sweden and Norway and the Alps can only hold so many people. Naïve as their conclusion might be, those in the leadership of the OSCE have concluded that migration along the highlands of Uzbekistan and Tajikistan and thence to eastern Russia and the new Equator is a worthy goal. They seek to facilitate such a route! Crop circle hoax are a type of disinformation in that they purport to be something they are not. We have mentioned that there are clues that a crop circle is a hoax, characteristics that allow them to be easily recognized. Hoaxes do not include symbols such as faces. Hoaxes include many straight lines and mazes where legitimate circles are symmetrical circles almost exclusively. A third clue is how the grain is laid. Though hoaxes recently have become more sophisticated, able to create perfect circles, they still cannot lay the grain down by bending the grain at the nodes as legitimate circle maker can do with a growth stimulant. The grain is crushed, and not interwoven, in hoaxes. 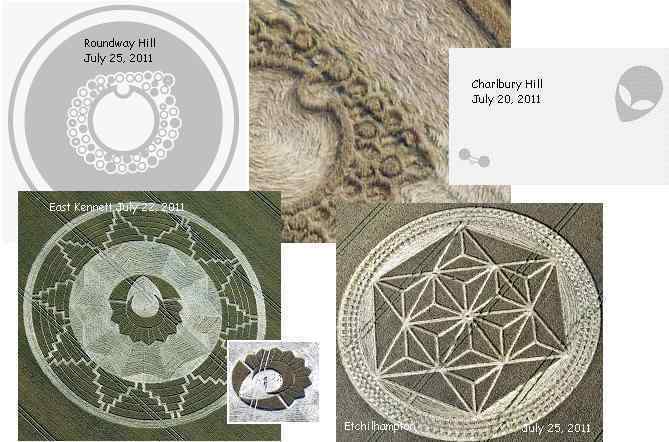 Accordingly, Charlbury, Etchilhampton, East Kennett, and the Roundway Hill laid on July 25 are all hoaxes. In contrast, the Roundway Hill laid on July 23 and Windmill Hill are legitimate designs. Windmill Hill is laid into quarters, the outside circle a half and an inner circle the other half. This represents Earth seasons, and where the planets lie in their orbits vs a vs the Earth calendar. We have mentioned that the Earth was blocked in her orbit in December, 2003 and thence pushed back into the August position, where she rides now. Earth, with her Moon, is shown on the diagram pushed back counterclockwise, in front of the retrograde orbit of Planet X, from one of the larger circles (December) on the outer ring. Roundway Hill shows the dual 270° rolls that Planet X performs. On one side, the 180° turn followed by a 90° turn is clearly shown. But what of the overlapping circles on the other side? This shows the interaction with the Earth, which goes into a severe wobble and pole shift, even turning upside down during the Last Weeks at one point. The first 270° roll involves the Earth, while the second only involves Planet X which is rapidly leaving the solar system at that time. What can be said about republic of Buryatia? Of course there is a prediction about Irkutsk and he is close, but in Buryatia is extinct volcanoes since the ice age, the age of 10-15 thousand years, whether they should take into account what to expect from the Baikal rift system (zone). Buryatia is located on the Russian border, next to Mongolia. [and from another] http://www.baikalcomplex.com/jeeporlick.htm The East Sayan Mountains is relatively young, rocky mountain system covering vast territory from Altay Mountains throughout Tuva Republic to Russia-Mongolian frontier and Lake Baikal. Lake Baikal and the Baikal rift zone to the east of the lake are in a region in the great Eurasian Plate that tore open in the past. This will not be the tear point this time around. We have stated that a new seaway will tear open in the Eurasian Plate, up along the border between Pakistan and Iran then on up toward the Urals. The mountains of eastern Russia, above Mongolia, will not experience tearing or mountain building. Lake Baikal and the rift region has some hot springs and mud volcanoes, but this will be the extent of volcanic activity, even during the pole shift. In that the climate there will be temperate in the Aftertime, this should be considered a safe location. Are the major powers looking beyond the pole shift to the Aftertime, plotting new boundaries and determining what of their land masses and fishing rights they want to protect, and which they are willing to desert? Absolutely. Military might, in the form of exercises, allow the country to demonstrate the military force they are capable of deploying. These exercises have far less to do with the partnerships and unrest at the current time, and more to deal with invasive forces they anticipate in the Aftertime. Russia is not anticipating invasion from the south, as rather its own people will be migrating south to invade those countries which enjoy higher ground. But the Urals, where their elite will reside, could be vulnerable from the Arctic. Oil fields exist there, under the waves, and the Russians are already making claims and establishing drilling rigs there. China's elite will reside in the new ghost cities clustered near their current power center, Beijing, and do not anticipate invasion from the deserts of their interior. Rather, they anticipate expanding into these areas in the Aftertime, incorporating whatever survival communities exist. Thus, their military might is focused on protecting their borders from the south, from the flooded lands of Indonesia and southern Asia. The US has recently abandoned military installations near Japan, clearly abandoning Japan in the process. In the Aftertime, Japan is expected to be virtually unlivable, due to their volcanoes and many nuclear power plants. That they turn around and announce a planned installation in NE Australia, which will be above the waves and with a good climate, is very revealing. It is no secret that Australia plans to be a home to the elite from many countries in the Aftertime. Could the Zetas provide an update on crop and food shortages around the world and ongoing famine in several African nations? Is the U.S. government allowing or working with agribusiness to cover up crop shortages that cannot be adequately explained without mentioning Planet X? It certainly appears both human and animal food producers/manufacturers are employing all kinds of deceptive practices, tricks, and excuses to cover up the true, high cost and/or low quality of food. [and from another] http://www.cbc.ca/news/world/story/2011/07/20/f-africa-famine-topix.html Tens of thousands of people in Somalia have died in the worst hunger emergency in a generation, according to the United Nations, which will begin airlifting supplies in a desperate bid to reach at least 175,000 of the 2.2 million Somalis whom aid workers have been unable to reach. The vast majority of them, however, remain cut off from emergency aid because the UN World Food Program hasn't been able to deliver supplies to militant-controlled areas. The Horn of Africa is suffering a devastating drought, compounded by war, neglect and spiraling food prices. More than 40 per cent of its population of more than 160 million live in areas prone to extreme food shortages. Food production has not kept up with growth and farmers lack access to machinery and fertilizers. Some areas in the region have not had such a low rainfall in 60 years, according to the international aid group Oxfam. The World Food Program estimates that 11.3 million people across East Africa urgently need food aid and medical supplies. We have predicted that food shortages will creep up on those not directly in starvation areas, announcing itself as empty shelves and somewhat higher prices. Price controls have and will be in place, and black markets have yet to become prevalent. We long ago stated that governments no longer finding themselves with bumper crops will simply stop giving food stuffs to starving nations, and this has been the case for several years now. The UN complains, begs, and beyond an article in the press which does not hit the front pages, that's the extent of it. Starving people do not have access to the media, nor the energy to protest, in the main. Starvation is silent, thus. We see no change in the plans. Media coverage will be suppressed, price controls enforced behind the scenes, and the shelves becoming increasingly empty. .
Could the Zetas comment on the suspension and investigation of arctic scientist Charles Monnett. The federal agency he works for says its for "integrity issues". A watchdog group says it has to do with a 2006 journal article having to do with the death of some polar bears and global warming. But a source close to the investigation says it has nothing to do with the article or scientific integrity. The source, not authorized to comment on the issue, would say nothing further. Given that PX issues seem to be more easily identified in the arctic and antarctic regions, seems to me maybe the scientist was making noises about the issue and needed to be silenced. Just sounds fishy to me. [and from another] http://news.yahoo.com/apnewsbreak-arctic-scientist-under-investigation-082217993.html Just five years ago, Charles Monnett was one of the scientists whose observation that several polar bears had drowned in the Arctic Ocean helped galvanize the global warming movement. The federal agency where he works told him he was on leave pending the results of an investigation into "integrity issues." BOEMRE, which oversees leasing and development of offshore drilling, was created last year in the reorganization of the Interior Department's Minerals Management Service, which oversaw offshore drilling. On July 18, BOEMRE told the longtime Anchorage-based Monnett that he was being put on leave, pending the investigation, according to the complaint. BOEMRE has barred Monnett from speaking to reporters. Monnett's work included identifying questions that needed to be answered to inform the environmental analyses the agency must conduct before issuing drilling permits. Clearly the oil companies interested in drilling in Alaska consider Monnett a threat, as rather than a lack of integrity, he has too much. Simply establishing a new agency to handle drilling requests is hardly going to stop corruption, as those responsible for the Gulf disaster were at a high level, and only underlings were fired. They Department of the Interior is thus back to business as usual, taking bribes, now in Alaska. The charges against Monnett are not being released as there currently are none. The investigation is on what is called in legal terms a fishing expedition. They are looking for something with which to charge him. The outcome of all this, being very much in the hands of man, is still uncertain.